Is your birthday in June? Find out about your birthstone! 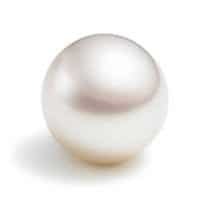 Anyone born in June will know that their birthstone is the pearl, a symbol of purity since the times of the ancient Greeks and most probably, even further back into history. In fact, the Greeks so adored these lustrous globes of iridescence that they believed they were tears of joy, spilled from the eyes of Aphrodite, the Goddess of Love. Pearls are a particular favourite of our clients in Brisbane with many requests for custom jewellery designs throughout the year. Rings, brooches and earrings can all be adorned with one or more flawless pearls, but the key to the perfect jewellery design for pearls is elegance and simplicity. There is no need for complicated settings, as the pearls themselves are the very centre of attention. In Brisbane, we find that rhodium plating is a good match with pearls, because the white gold setting highlights their lustre and doesn’t compete with their beauty. If you are considering purchasing a gift for the lady in your life with a birthday in June, a simple strand of beautiful timeless pearls is always a winner. In Brisbane at our jewellery design workshop, more often than not we tend to use cultured South Sea and Tahitian Black pearls in our designs, because the availability of natural pearls is so limited. Cultured pearls are farmed throughout the South Pacific with some of the more popular pearls being farmed in Broome. Most of the cultured pearls are marine in origin however, but you can purchase freshwater pearls that have been farmed in China. Broome pearls: These pearls are particularly exceptional in their colour and depth of lustre and are often used as centrepieces for custom jewellery orders at our Brisbane studio. Tahiti pearls: The waters of Tahiti and French Polynesia are famous for producing brilliant black Pearls with an incredible dark, deep lustre. Sizes available range from very small, well suited for Pearl strands to large stand alone pieces which go nicely custom made into pearl enhancers. Akoya pearls: Some of the more affordable pearls are farmed in Japan, but they are renowned for their perfection and are often used in necklaces. Freshwater pearls: Farmed in China, freshwater pearls are the least expensive choice and are not as symmetrical and perfect as other options. These pearls are often used in mass produced jewellery designs, rather than custom jewellery. Make an appointment to see us at our studio in the Brisbane Arcade, view our range of jewellery designs or order your custom jewellery. https://ashleydouglas.com.au/wp-content/uploads/june.jpg 202 200 Ashley Tester https://ashleydouglas.com.au/wp-content/uploads/Logo.png Ashley Tester2017-06-15 00:00:172017-12-28 10:23:15Is your birthday in June? Find out about your birthstone!